"I have planned the establishment of my own jazz-trio for long. Besides the complex instrumentation and compositions of After Crying, I have always wanted to play more spontaneous and flexible music. I have worked with many jazz musicians but it was obvious for me that I would ask Viktor Hárs to play bass guitar. Open-minded and creative, Viktor is an internationally recognized musician who plays well in all genres. Furthermore, he is a great composer. 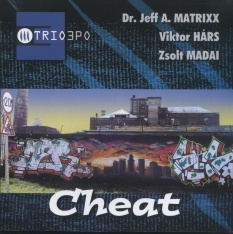 Mirkó Milosevits (Dr. Jeff A. Matrix) played the keys. Mirkó is known in the Hungarian pop music, and he has got also an ego expressed with rhythmic and lively jazz. In addition, he is fan of Fender Rhodes and Moog instruments, so important in the trio sounding. We have transformed Viktor Hárs’ compositions to our style but some were also composed for this band. We succeeded in having everything for the first or second recordings. With no correction, only some key parts were recorded later. Several compositions were played in the studio for the first time, shaped instinctively. The trio plays with its permanent members on the CD with the invited musicians to have a more colourful sounding. At its concert, the Trio 3PO plays the composition in a different way without the soloists. We always look for new music possibilities which sometimes have surprising results." 6. Keep Wise. Lö Funk!